Pasta is hearty and full of flavor. Served traditionally with Alfredo or marinara, there are countless ways to enjoy the Italian favorite. Whatever the ingredients, pasta has a way of bringing people together. Look out for the squid ink —used primarily as a coloring agent — it’s rather unusual. We also love the Carbonara, which uses hard-boiled egg as one of the main ingredients. Gather around with a fork and spoon and dig into these comforting plates. From tagliatelle to penne, here are 26 essential pasta dishes to try in town. With horse paintings and cowboy hats hanging between bunches of dried flowers, HiFalutin has an all-around Southwestern feel. The General’s Favorite Chicken is made with cavatappi noodles in a light pesto cream sauce. It’s topped with feta cheese, artichoke hearts, sun dried tomatoes, and chopped walnuts. The walnuts give an extra crunch, while the sun-dried tomatoes bring boldness to the dish. For more information, visit hifalutintucson.com. North Italia makes their pasta fresh daily. Their Squid Ink Mafaldine is mixed with shrimp, calamari, and acqua pazza (poached white fish). It also includes mint, fennel pollen, and Calabrian (Italian) chili for a hint of spice. The slightly dense, ribbon-shaped noodles pair perfectly with red sauce that has a kick. For more information, visit northitaliarestaurant.com. Fox Restaurant Concepts — owners of Wildflower and a few other local restaurants —always bring their A-game. Wildflower serves New American cuisine in its modern, airy restaurant. The Spinach Pappardelle is plated as a towering mix of ribbony spinach noodles in a broth-like sauce. It features house-melted tomatoes, roasted chicken, spinach, and pine nuts. The end result is hearty, rich, and colorful. For more information, visit wildflower-american-cuisine. From the moment you enter Jonathan’s Cork, filtering aromas paired with a dimly lit atmosphere draw you further in on your quest for fine flavors. Their Shrimp Scampi Pasta uses large, fresh shrimp — hard to come by so far from the ocean. The dish is served with fusilli pasta and covered in an incredible, buttery white wine sauce sautéed with shallots and garlic. For more information, visit jonathanscork.com. Family-owned Dolce Vita has been serving the community for 40 years. Regulars love their large portion sizes and cozy atmosphere. Their version of the famous Italian pasta dish, Carbonara, delivers. It incorporates bacon, ham, and eggs over spaghettini with a light cream sauce. Keep up with Dolce Vita on Facebook. Al forno is another way of saying ‘oven-baked’ food. This savory and enticing dish has rigatoni, meatballs, pepperoni, and hard-boiled eggs. It is baked in pomodoro sauce and topped with fresh mozzarella. Michelangelo’s is family-owned and the recipes have been passed down for generations. For more information, visit bottegamichelangelo.com. The Italian-based and world-renowned True Neapolitan Pizza Association awarded Vero Amore the “Authentic Neapolitan Pizzeria” certification. This speaks to the high level of freshness and quality in the restaurant’s ingredients, reflected both in their pizzas and pasta. Try the Chicken Mimosa. 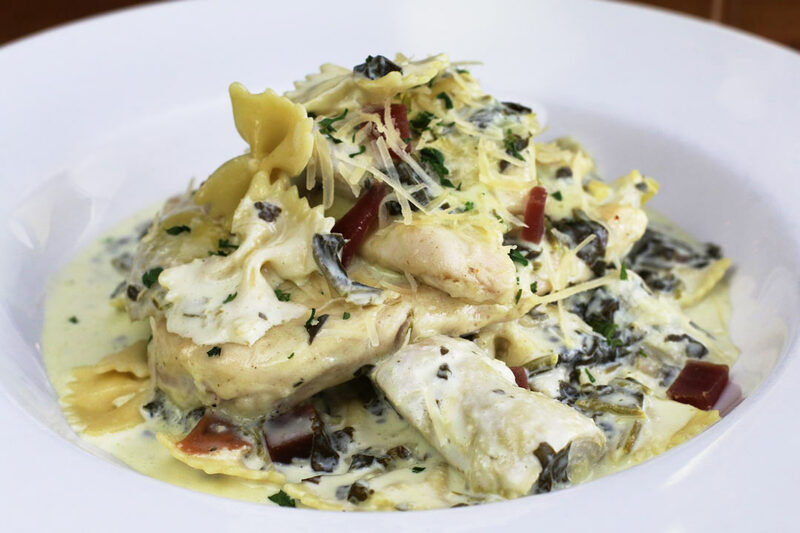 It includes artichoke hearts and prosciutto sautéed with chicken to complement bowtie pasta in a spinach cream sauce. Centered on their passion for cooking, Caffe Torino makes Northern Italian recipes that have been passed down for generations. For their signature lasagne, they make their own green pasta in-house. It is layered with bolognese, bechamel sauce, and parmesan cheese. The restaurant has a huge wine selection and a reputation built on authentic homestyle Italian cooking. For more information, visit caffetorinotucson.com. Linguini with Grilled Salmon – Sauteed red onion, kalamata olives, capers and tomatoes tossed with basil oil. Chef and owner Daniel Scordato provides fine Northern Italian dining at Vivace’s. Enjoy their delicious linguini served in an upscale restaurant with a modern feel, amazing view, and a nice bar. The colorful dish incorporates sautéed red onion, Kalamata olives, capers, tomatoes, basil oil, and tender salmon over linguine for a meal to remember. Our new menu items drop this Tuesday! This Short Rib Primavera is a staff favorite! ? Famous for charcuterie, Zona 78 brings the heat when it comes to pasta, too. The large, flat noodles are a comforting comparison to the classic fettuccine. The savory dish is served with braised short rib, diced grilled asparagus, button mushrooms, whole cherry tomatoes, baby spinach, white wine, butter, and blended oil. Located in the base of the Foothills, Tavolino has a sophisticated and cozy ambiance. Their impressive wine selection includes many from regions of Italy and France. The Ravioli di Zucca is a melt-in-your-mouth, homemade butternut squash ravioli with brown butter, parmesan, and sage. Bazil’s has many unique lamps lighting an otherwise dim dining space. Their private booths create an atmosphere perfect for unwinding or for date night. Try the sautéed shrimp and scallops with red bell peppers, garlic and asparagus in a gorgonzola white wine cream sauce served over fettuccine. Reilly Craft Pizza & Drink fuses modern lighting and historical architecture for a contemporary ambiance. The smell of basil wafts towards you from the gorgeous bowl of tube-shaped pasta covered in peppery, creamy vodka sauce. They also make incredible cocktails – I recommend the Boy, Don’t you Look Nice! to go with the house-made pasta. The grapefruit in the drink is refreshing and pairs well with the al dente rigatoni. Gnocchi is a pasta-like dish made with potato and flour. Trattoria Pina’s soft, chewy gnocchi — resembling mini dumplings — are made in-house and served in a spicy garlic marinara cream. Organic food that’s locally sourced? There’s a lot to love about Renee’s — including their pasta. They offer several gluten-free options, including a vegan Zoodles dish that uses organic zucchini and your choice of sauce. The colorful, aromatic dish has artichoke, red peppers, garlic, onions, basil, broccoli, Kalamata olives and spinach in Alfredo sauce. Zinman’s Vegan Pasta Salad is not your typical pasta salad. They use their house-made cold noodles made from local Durum wheat — a type of whole wheat from a non-GMO grain. They even mill their own flour for the pasta. The noodles are served on a bed of raw seasonal crunchy vegetables with tahini sauce and top it with pistachios. If you’ve never had pistachios in a pasta dish, you’ll wonder how you’ve been missing out all these years. For more information, visit zinmans.com. 5605 E. River Rd. Ste. 201 • 10355 N. La Cañada Dr. Harvest values local and seasonal foods, which is reflected in their menu. We found their house-made Saffron Turmeric Pasta to be one of those ‘don’t want to miss’ kind of dishes. It features sautéed mushrooms, leeks, and sun-dried figs, all tossed with light sherry cream sauce and topped with goat cheese. Parish’s original wine-soaked pasta dish combines burgundy angel hair, shrimp, and crawfish with a lobster broth, savory saffron red pepper cream sauce, and fresh parmesan. It is an original Cajun-inspired entrée. Served in an eclectic space with Southern charm, the Drunken Angel is a Tucsonan favorite and promises rich flavor and a fair share of seafood. Caffe Milano is headed by chef Fulvia Steffenone — also known as La Fufi. The dishes are inspired by La Fufi’s Italian background and are of a high standard. The restaurant offers authentic Italian cuisine which includes rotating daily specials. One of their specials, the Carbonara, is made with tagliatelle, asparagus, and shrimp. For more information, visit lafuficaffemilano.com. Family-owned Fresco specializes in scratch-made eats and makes a mouth-watering Meat Lasagna. They generously layer pasta sheets made in-house, sausage and homemade meatballs, ricotta cheese, and homemade tomato sauce. The incredible baked result is full of flavor. This family-owned restaurant prepares classic Italian dishes such as pizza, calzones, chicken marsala, and pasta. Their Shrimp Scampi has gulf shrimp in a buttery garlic white wine sauce and is tossed with pasta. The spicy dish lets you believe in their motto, ‘Mangia bene, vivi felice’ (Eat well, Live Happy). A staple in Tucson since 1956, Mama Louisa’s delivers Italian-American cuisine that delights. Customers value its tradition and commitment to homemade classic dishes. Joe’s Special has been their signature dish since opening. The massive portion of house-made linguini has hot pepper seeds, garlic oil, melted cheese, and house sauce. Bring your appetite! This chic Hilton restaurant takes modern concepts and Italian cuisine to heart. The open floor plan makes for an inviting space. The restaurant and wine bar serves a contemporary pappardelle dish that includes short rib, mushrooms, house-made ricotta, kale, and pomegranate seeds. For more information, visit hilton.com/dining. Thursday's means we're almost to the weekend and it's spaghetti and meatball night.??? On Thursdays, Primo has a Spaghetti & Meatball night, which includes a glass of crisp red wine for $25. They pick ingredients — such as mint and tomatoes — fresh from their garden. With award-winning chefs and gorgeous mountain views, visiting Primo is highly recommended. For more information, visit marriott.com/hotel-restaurants. It’s no wonder that Piazza Gavi is known for pasta, they’ve got choices galore. Whether you prefer your pasta traditional, baked, or smothered in marinara there’s something for you. Choose from spaghettini, fettuccine, mostaccioli, or angel hair, to name a few. I recommend the Spicy Crema which has pepperoncini and tomato cream sauce. For more information, visit gavicucina.com. This neighborhood pizza and pasta joint is famous for Chicago-style stuffed pizzas. They’re also known to dish up homemade pasta with a simple garlic-oil sauce and serve it with garlic bread. The pasta is perfectly cooked and makes for a hearty meal.